You don’t know the power of Star Wars merchandise. Case-in-point: This massive new line of Star Wars pet products coming from PetCo. Get ready, Fuzzballs, as nearly every conceivable item a pet (or pet owner) could need is getting the George Lucas treatment with Star Wars themed leashes, toys, and care products. And that’s just the tip of the galaxy. There’s also Star Wars-themed pet cosplay, because, well, why should we humans have all of the fun. And the mouse Han Solo in carbonite plush may be the best piece of anything that we've seen in a long time. Check out PetCo’s full line of Star Wars goodies in the gallery below, which should have something every big (or small) walking carpet out there. 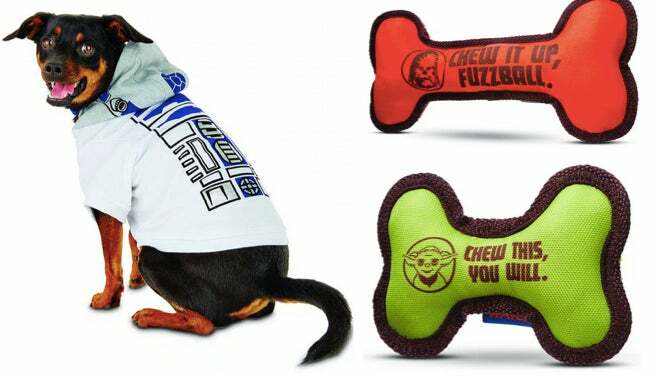 Will you let your four-legged friend embrace the force with these Star Wars pet supplies? Let us know in the comments below (but please, no barking).